Dominican students transplanting verdolaga at the UMass Research farm in 2013. Dominicans are now estimated to be the largest Latino ethnicity in Massachusetts, recently surpassing Puerto Ricans. 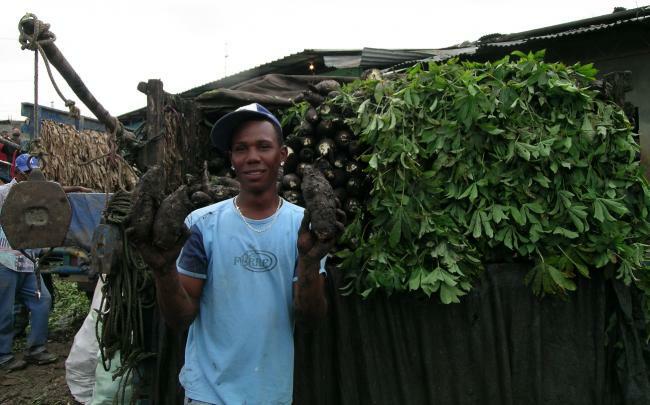 Frank Mangan’s international program World Crops has researched and introduced several crops popular among Dominicans and introduced them to commercial farmers. In 2013, the Minister of Youth of the Dominican Republic contracted with the University of Massachusetts Amherst to provide Dominican students hands-on and classroom training in sustainable production and marketing of fresh produce. As part of this project we grew calabaza and verdolaga at the UMass Research Farm. Plans are underway to collaborate with two universities in the Dominican Republic, one being the Instituto Politécnico Loyola. Harvesting calabaza at the UMass Research Farm in 2013.